Provides medium duty circuit protection for 25 to 200 amp loads when switching and circuit protection are both required. "Trip-free" - cannot be held closed after trip. Visible reset lever shows open condition. 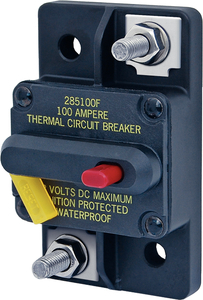 Drop in replacement for 185 series circuit breakers. Maximum operating voltage is 48 volts DC. Meets SAE J1171 external ignition protection requirements. IP67-protected against immersion up to 1 meter for 30 minutes.